My parents were pretty liberal. So grounding consisted of; not being able to sleep over at someone’s house but being able to play at someone else’s house and anyone can sleep over or play at our house. 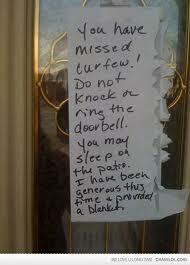 We were allowed to “sneak out” of the house at night if we told our parents first. Kind of defeats the “sneaking” part. So this is how they do it at other kids' houses.